(THE NEW PAPER) - When I first met the late US celebrity chef Anthony Bourdain 17 years ago, I did not know who he was - to me, he was just another food TV host asking me to appear on his show. I obliged but I told him that the location had to be my call. I arrived late and saw this six-foot giant peering at the live seafood tanks at the Sin Huat Seafood coffee shop - he looked like a big kid in a toy shop. He pointed to a sentence in my Makansutra food guide, that "food on screen and print is an oxymoron, it must be devoured". We hit it off during the shoot. I remember that the last dish we had was chef Danny Lee's signature Crab Beehoon. Bourdain took a bite, then did his signature monologue about lives and loves, gushing how he would not mind if the world ended right after that meal. So I said: "Why do you talk so much when there is food on the table? My mother always told me to eat, then talk, because you never know if your next is coming." We became buddies after that, and he wrote a whole chapter about it in his 2006 book, The Nasty Bits. 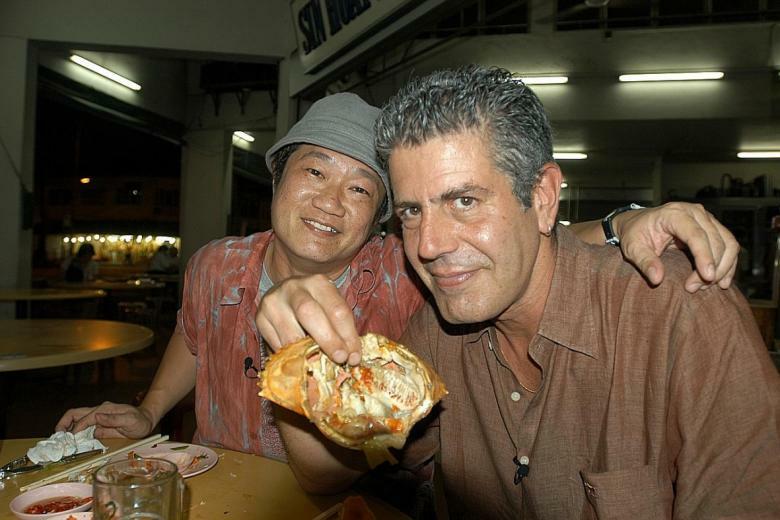 I dedicate this review to Bourdain as Sin Huat Seafood was his favourite haunt in Singapore. A few of us in the food scene still miss him so we gathered for a meal there recently to honour him - with the same $700 feast Bourdain and I had back in 2001 - and the food has not dimmed one bit. Back then, when the Black Bean Scallops was served, Bourdain slurped the scallops up like a man on a mission in an oyster bar, one at a time and oblivious to his surroundings. The scallops are still a delight, especially the freshly chopped garlic chunks in the blended black bean sauce. 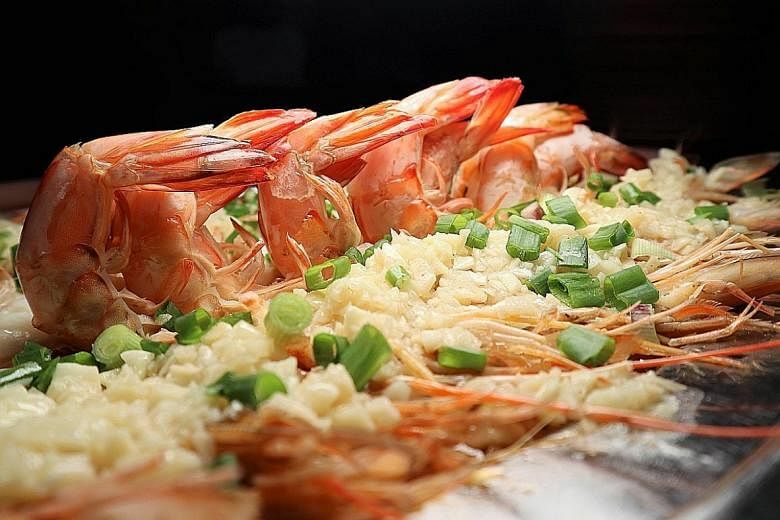 Similarly, the MRT Prawns, as coined by Makansutra - that row of steamed king prawns doused in wine, soy and overflowing with garlic bits - was divine. One of my makan partners, chef Sau Del Rosario from the Philippines, fell silent as he tore into the fresh crunchy crustacean. When the Chicken Essence Frogs was served, six little bottles of the essence were emptied over the fresh wine-steamed bullfrogs. I remember Bourdain being taken aback as he hated frogs, but after that dish, he was a convert. Even now, every morsel still has a springy clean taste and texture - a sign that it is fresh and perfectly steamed. I don't think many chefs can steam a sotong like chef Lee, done simply in wine, garlic and soy (you get a sense now that garlic is his main agent). It was like Danny was paying tribute to the integrity of the dish. When the Seafood Otah and Kailan greens was served, the handmade otah was thick, chunky and spicy and the vegetable was perfectly wok-seared to retain texture and sweetness. But these were mere sideshows. 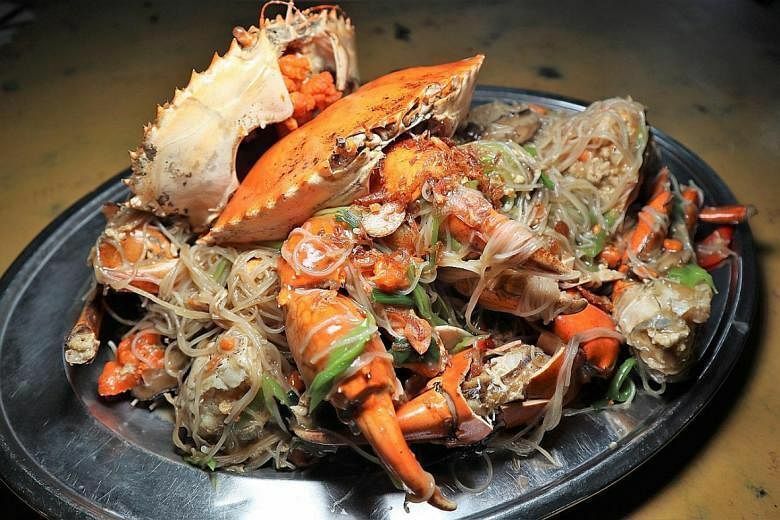 The grand finale - just like back then - was the Crab Beehoon, where a two-crab portion can set one back by $180, depending on the size of the giant Sri Lankan crabs. Sin Huat first-timer Benny Se Teo of The Meathouse was over the moon. Sweet, savoury, rich, meaty, aromatic and "wok skill" are all terms we use to describe this signature of Danny's. May this culinary sensation never cease to exist. Bourdain and I need to repeat this in our next lives.